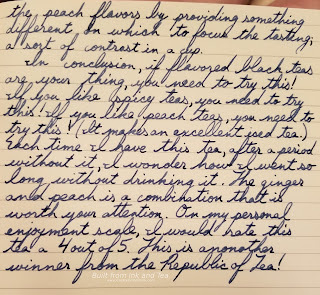 In honor of the 2017 San Francisco International Tea Festival, happening TODAY, we bring you a special Sunday tea review of the Republic of Tea's Ginger Peach Black Tea. 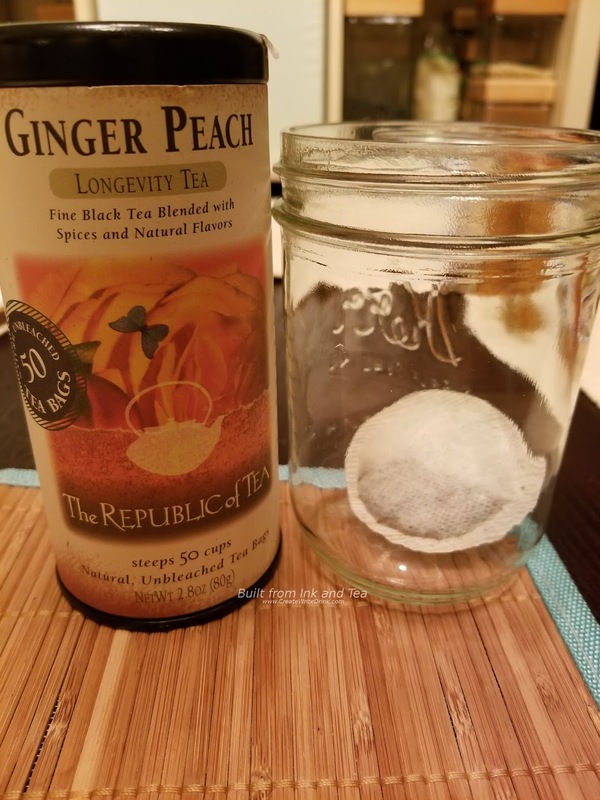 The Republic of Tea Ginger Peach Black Tea is available from their website, here. Text is copyright 2017, Built from Ink and Tea. 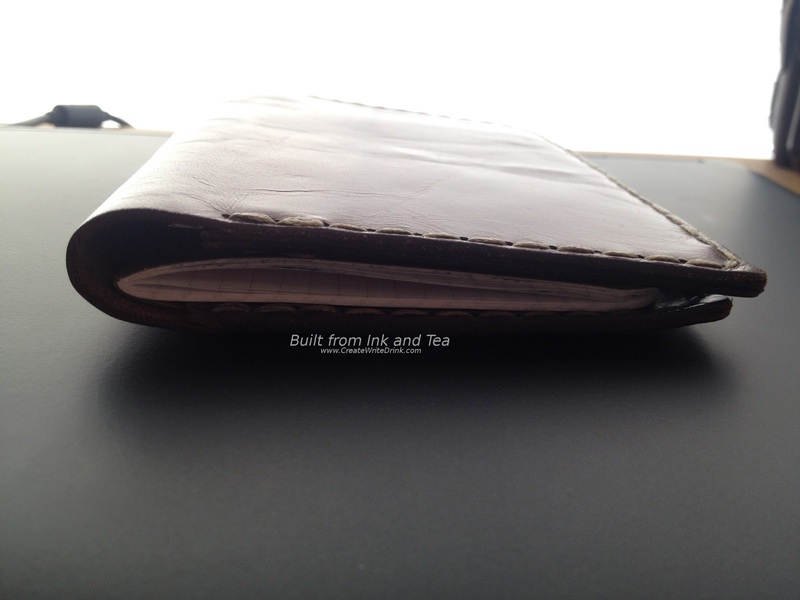 We at Built from Ink and Tea are incredibly excited to be returning to you all with more reviews! During our time away, we brainstormed new ways to bring you content, and this will lead to some good changes around the site. The first of these changes can be seen in the below review with the handwritten content! 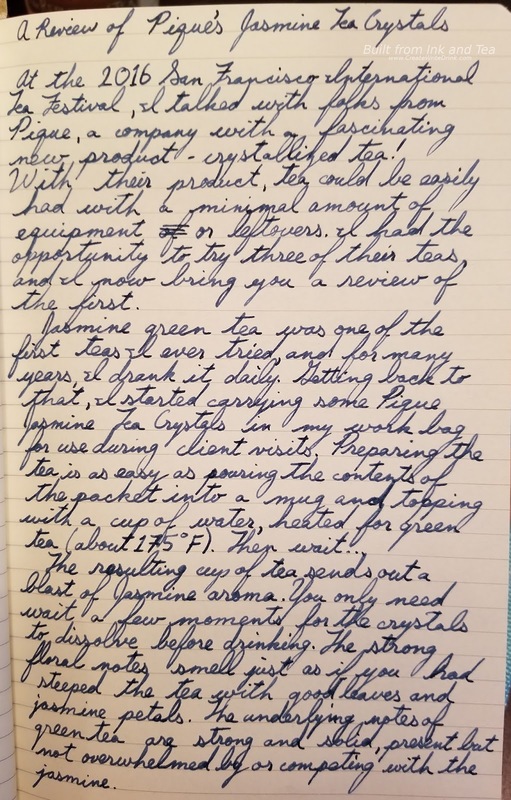 Given that Built from Ink and Tea covers ink and writing instruments, it seemed only fitting to continue the merger of writing and tea-drinking in this manner. While reviews will initially be posted with the handwritten content, we will also be transcribing them, as we understand that some of you enjoy our content from mobile devices, where it might be difficult to read the photos. (Edit: Scroll down for the transcript!) 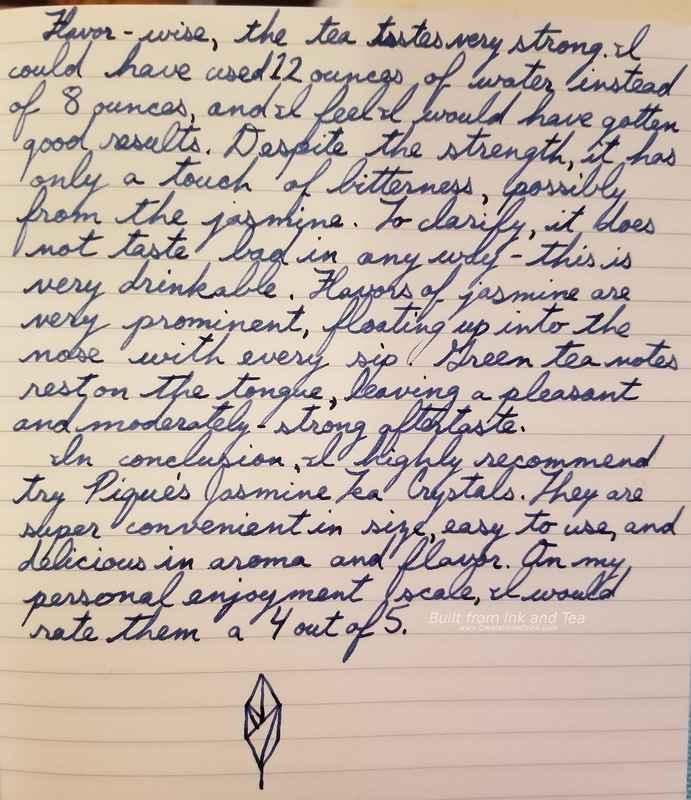 Please share any feedback you might have about our new handwritten reviews in the comments section, below! 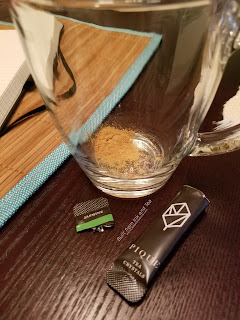 At the 2016 San Francisco International Tea Festival, I talked with folks from Pique, a company with a fascinating new product -- crystallized tea! 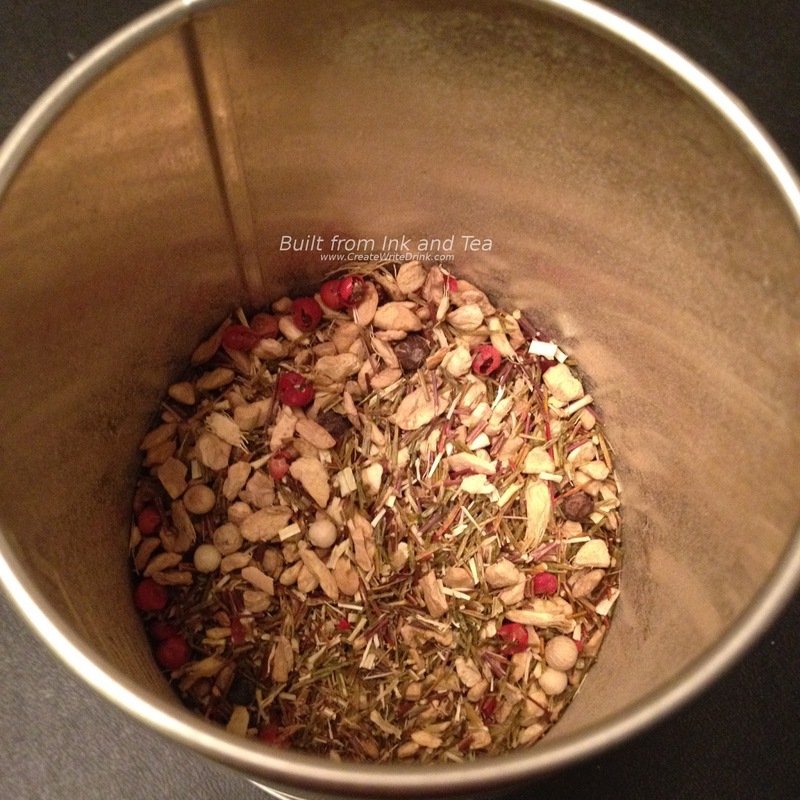 With their product, tea could be easily had with a minimal amount of equipment or leftovers. 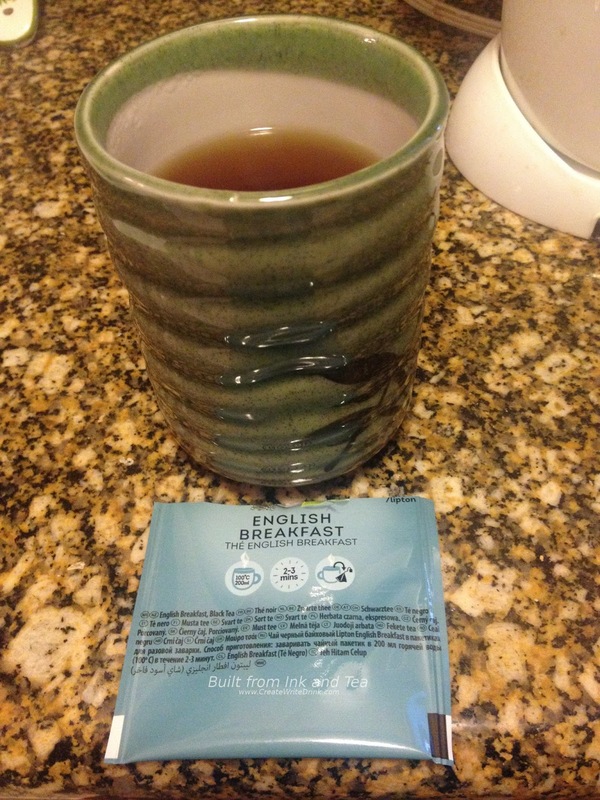 I had the opportunity to try three of their teas and I now bring you a review of the first. The resulting cup of tea sends out a blast of jasmine aroma. You only need wait a few moments for the crystals to dissolve before drinking. The strong floral notes smell just as if you had steeped the tea with good leaves and jasmine petals. 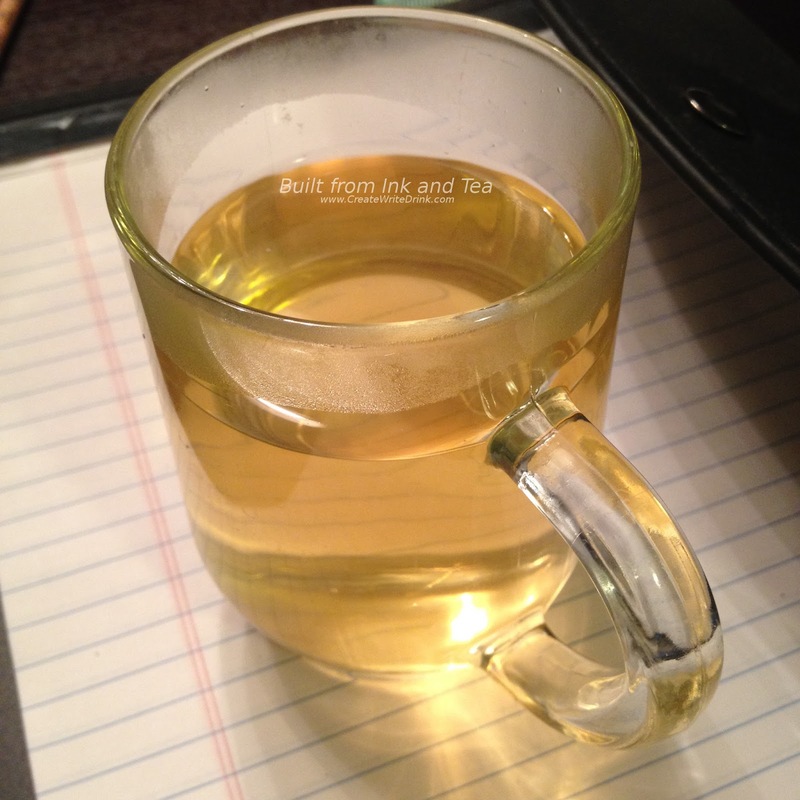 The underlying notes of green tea are strong and solid, present but not overwhelmed by or competing with the jasmine. Flavor-wise, the tea tastes very strong. I could have used 12 ounces of water instead of 8 ounces, and I feel I would have gotten good results. Despite the strength, it has only a touch of bitterness, possibly from the jasmine. The clarify, it does not taste bad in any way -- this is very drinkable. Flavors of jasmine are very prominent, floating up into the nose with every sip. Green tea notes rest on the tongue leaving a pleasant and moderately-strong aftertaste. 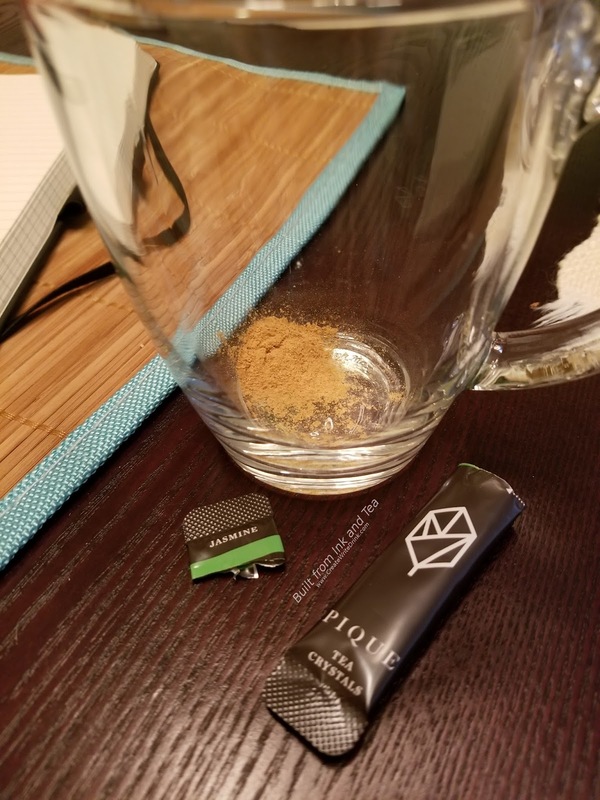 In conclusion, I highly recommend trying Pique’s Jasmine Tea Crystals. They are super convenient in size, easy to use, and delicious in aroma and flavor. On my personal enjoyment scale, I would rate them a 4 out of 5. Pique Jasmine Tea Crystals is available from their website, here. 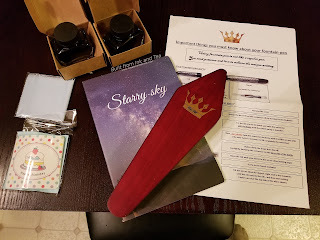 Upon receipt of the King Nib Fountain Pen Writing Set, I eagerly opened the box, revealing all of the interesting gear included with the pen. This is most certainly much more than just a two-nib pen set; it also comes with two bottles of ink, two converters for the pen, a wooden gift box, a screen-cleaning cloth, a small “Happy Birthday” card, a wide-ruled journal, and an informational sheet about fountain pen usage. The informational sheet especially stood out to me, as very few pens come with these. Certainly, many fountain pens are targeted at folks who are already familiar with the workings of a fountain pen, but the inclusion of such a sheet could make this set even more fitting for the beginner fountain pen user. 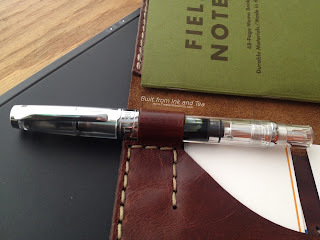 While this review will be primarily for the pen, I wanted to go ahead and mention that I appreciate the inclusion of these items, and it shows that a lot of thought went into designing the set. 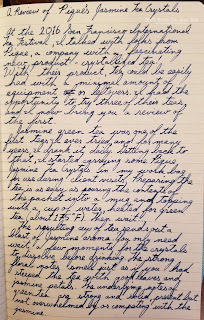 I successfully tested three different inks on the paper in the notebook for fountain pen-friendliness, each showing-through a bit with no bleed-through or spread. It would be nice to see the informational sheet edited slightly for English grammar and wording, but the information provided is solid. Two unlabeled bottles - one blue and one black - comprise the provided ink. 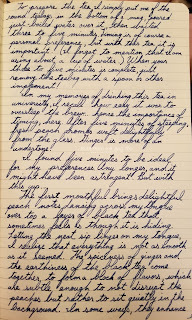 After testing the ink in both the King Nib pen and a Pilot Metropolitan (the latter with which I have never experienced any ink-drying issues in the past), I found that there were no issues with the ink itself. 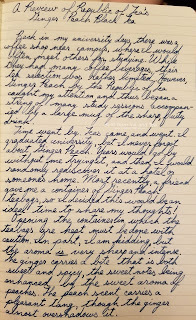 The Metropolitan started writing right away, after being left for several weeks. More to come on the King Nib and its writing. Straight out of the box, the wavy pattern that runs the length of the barrel and the cap struck me. It really catches the eye in a positive way, the curves emphasizing the shape of the barrel. There is a slight taper with the cap and body, where the cap is a touch wider than the body, and the barrel tapers a bit more sharply toward the end. Not stunning, but classy, would be an apt description for this pen. My first impression of the black band around the center and the black end cap were that they really broke-up the design, and that the plastic material from which they are made would just look cheap. After a couple of months of use, I mostly disagree with my first impression. The black does break-up the silver, but that might be for the best, as a full-silver barrel could be great...or it could look over-the-top. Additionally, the black band and black end cap do serve to balance the black stylus that is on the tip of the cap. I will talk more about that in the Design section, but the inclusion of a stylus gives the pen a more-functional/less-dressy look. As a pen that comes in a set like this, I feel that this fits with the use-case. Sure, it may be more casual or day-to-day-focused. The creator intended the pen to look good, but they also intended that it be frequently used, rather than finding a display-home on a desk. The King Nib branding has been placed on the side of the cap in an area without the wavy lines. It is small and unobtrusive, looking more like an area for personalized engraving than a brad name, but I appreciate the lack of over-the-top branding, and it does feel fitting for this pen. The King Nib fountain pen bears an uncanny resemblance to the Jinhao 250, albeit it seems as though the designs have been improved - adding the full-body engraving, changing the nib, making the material color choices cleaner, adding a stylus, and relocating the branding. From a design standpoint, the placement of the stylus has been chosen to be as least intrusive as possible. It shortness is balanced by the slightly wider black band on the bottom of the cap and even wider black end cap on the body. They flow well with the taper of the pen, which seems smooth, even with a few interruptions. 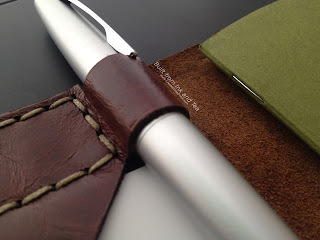 The clip of the pen is very strong and functional, and the clip's grip is very tight. It may be too much for some thicker shirts or pen loops. But it has been placed such that there is a large gap between it and the pen cap, allowing for those thicker pen loops to hold it snugly, if it can be slid over them. The pattern on the clip disappoints me slightly. It only partially fits with the wavy lines on the rest of the body, but I appreciate that the branding is not placed on the clip, as the clip presents a plain, sleek view to anyone seeing this pen on a shirt pocket or notebook. The cap snaps onto the body of the pen, rather than being threaded. I personally prefer threaded caps, as snap caps tend to have more wear on them and risk wearing down or breaking over time. However, the point on the pen body, where it snaps into the cap, is situated just below the nib and above the grip, which I have found to require less effort to close (versus a snap-in point below the grip and above the rest of the barrel). The grip itself has grooves that run the circumference, slightly tapered by otherwise cylindrical, with no angled surfaces to guide one’s grip on the pen. The plastic is a bit slick, but otherwise I found no issue with the feel of holding it for an extended period of time. The threads on the grip do not tightly fit into the threads on the barrel. While it does close closely - and remains closed fairly well - I have had times, where I removed the cap and in doing so loosened the grip from the barrel. The King Nib fountain pen does not post well. To me, this is fine, as I rarely post my pens, though I am sure that some may be disappointed by this. 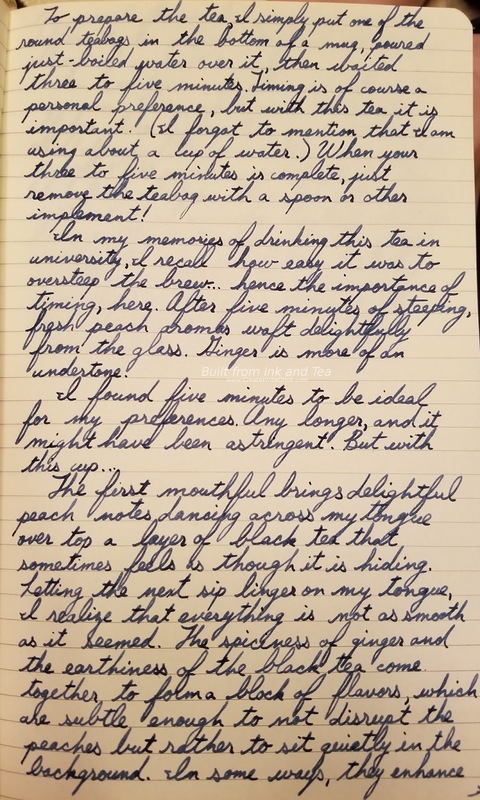 I found the writing experience with the King Nib fountain pen to be fairly pleasant. 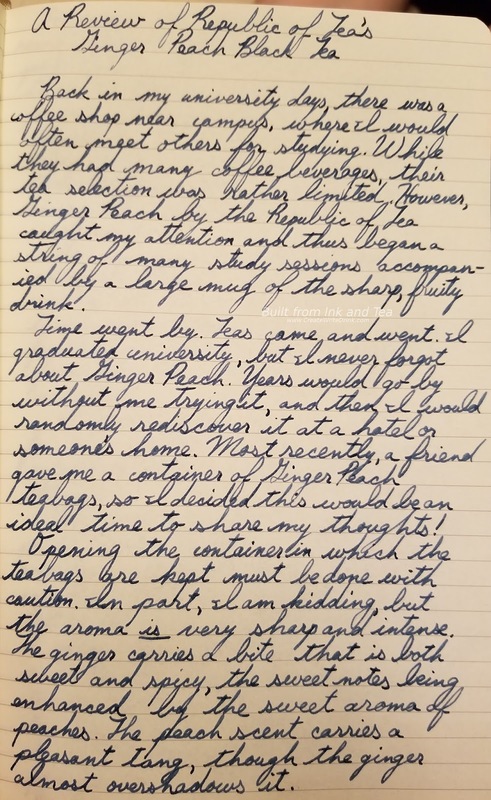 For the price point, the stock steel nib fared well, offering moderately smooth writing on Field Notes, Tomoe River, and general copier paper. The nib itself is nothing special and might be upgradable based on the size. Of special interest is that the pen does come with a second nib in the form of an entire second grip section with nib. This secondary nib is of the eastern Fude style, intended for use with some calligraphy. While this is not something that would sell me on the set, I did think it was a very cool addition, and I know some folks that would be eager to have a combined set like this. For what they are, I would rate the nibs highly. A filling system that takes standard international cartridges and allows for using standard converters - definitely desirable in my book. That alone would lead me to rate this highly. However, when I left the pen for a week without using it, it had difficulties writing again upon my return to it. Even priming the nib by expelling a bit of ink only provided a temporary solution. 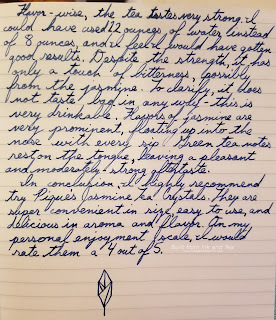 Compared to other pens, which I can store nib-upright and use immediately after weeks of not, this was the biggest issue I had with the King Nib fountain pen. A bit of shaking the pen would sometimes bring the ink back to the nib, but the flow was hesitant and inconsistent. I believe this problem stemmed from the filling system, as the nib was completely clean and not clogged with ink. If this pen uses the same internals as the Jinhao 250 (mentioned earlier), then they leave something to be desired. When last I checked the price for the full King Nib fountain pen set on Amazon (one cannot buy the pen separately), the price had been lowered temporarily from $37 to $29.98. Considering the contents of the set, I feel that this cost feels like a decent value. 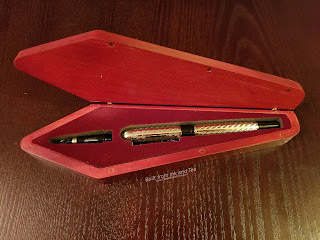 However, the value here is in purchasing the set itself, needing two more bottles of ink, desiring to try the secondary calligraphy nib, perhaps giving this as a gift (in which case the wooden box is a major plus). For someone, who is looking to simply add another fountain pen to their collection, the extras might be nice but unnecessary. The King Nib fountain pen, along with all of the extras included in the set, would make a good starting point for those interested in calligraphy and fountain pens. 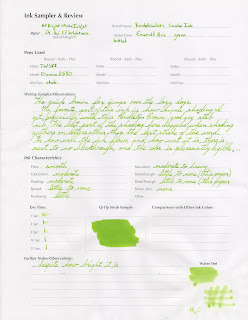 The options for nibs and ink colors are complemented by an approachable price point and a good-looking pen. While the internals could be better, the pleasant writing experience should provide a good introduction to those new to these unique writing instruments. Thanks to King Nib for sending me this pen. It was provided in exchange for an unbiased review. The King Nib Fountain Pen Writing Set is available from Amazon, here. On the heels of my last review, which covered Runa's Traditional Guayusa, I am excited to bring you my thoughts on a variation this week - their Mint Guayusa. 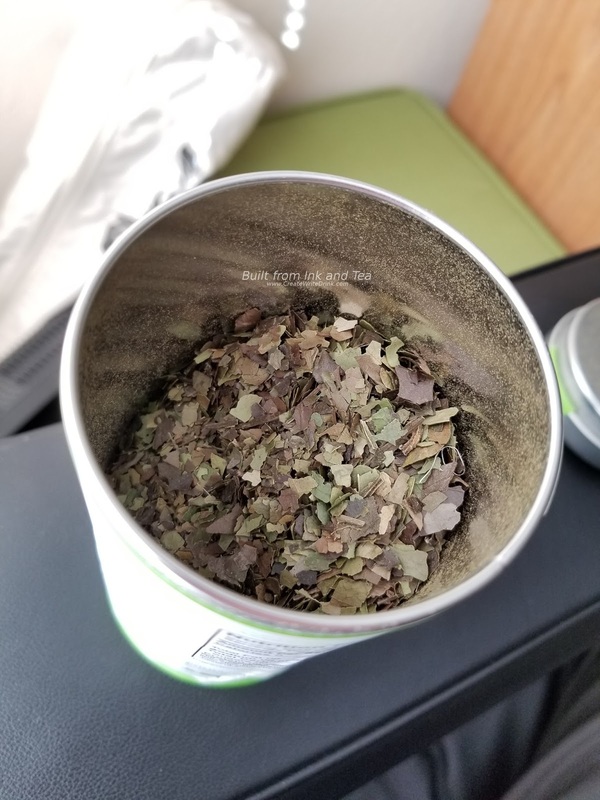 I brewed my pot of Runa's Mint Guayusa for five minutes, using setting 1 (for green and white teas) on my Adagio TriniTEA, with four teaspoons of guayusa and four cups of water. As I mentioned before, guayusa is not tea in the sense that it is not from the camellia sinensis plant (as black teas, green teas, white teas, etc. are), yet guayusa nonetheless has a lengthy history of use in making medicinal infusions in hot water and being consumed for its stimulating effects. Guayusa originates in South America and is a close relative of mate and yaupon (all three are types of holly trees). The infusion results in a cup that seems lighter in color than traditional guayusa, but the smell is certainly minty. In fact, most of the aromas are centered around the mint that has been added and only a small amount of roasted green notes from the guayusa show through. This provides an interesting contrast with the aromas I got from smelling the dry, loose leaf Runa. There, I felt as though the mint (while strong) balanced equally against the roasted notes of guayusa. 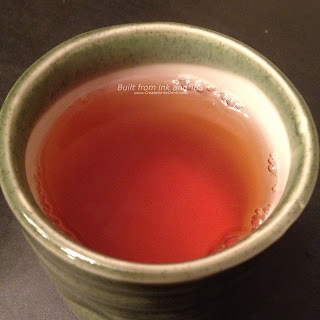 My first sip touches the tongue with the warm-to-cool transition of a cup of mint tisane. However, it never quite gets to the full coolness of mint, as the flavors of guayusa show themselves. I found that the guayusa did not seem quite so bold in the Mint Guayusa as it had in Runa's Traditional Guayusa. The flavors are overall very straight forward and to the point. There were not a lot of layers of complexity, as the two ingredients put forth their all in a blend of (surprisingly) medium-strength flavors. Overall, the Mint Guayusa from Runa made a very pleasant cup. I enjoy mint-flavored drinks, and this one provides a really nice hit of caffeine to accompany those minty notes. If you enjoy traditional guayusa (or mate or yaupon), give Mint Guayusa a try! On my personal enjoyment scale, I would rate Runa's mint guayusa a 4. Runa Traditional Guayusa is available from their website, here. If you happen to be a lover of tea and well-furnished spaces, and if you happen to find yourself in Downtown Santa Cruz, the very first place you should spend some quality time is Hidden Peak Teahouse. I had the pleasure of visiting this incredibly beautiful and relaxing shop for the second time recently, and my second impression was even better than the first. With both indoor and outdoor seating, the Gong Fu tea room is a haven for tea-lovers and peace-seekers who need someplace to unwind. If you decide to stop by, you can expect to be greeted warmly but very calmly, quietly, and somewhat formally by a member of the staff. They will ask if you've visited before, and will explain a few unique things about the teahouse if you're new. They serve Chinese tea, primarily in the Gong Fu ceremonial style; they have a small menu of light snacks; and the teahouse is digital-free. The no-devices policy is a blessing. It's very difficult, especially in the Bay Area, to find anyplace where having your phone out or asking about the Wi-Fi password is verboten. The ambiance of the teahouse is nearly sacred. This is a place where your soul can take a deep breath and expand. If you want to engage in something beyond silence or simple conversation, there are shelves of books and games to borrow during your stay. The most prominent sounds are clay teaware clicking against hardwood and water coming to a boil. The employees of the teahouse move around silently and respectfully, hardly interrupting whatever reverie you find yourself lost in. They will help you select a high-quality, seasonal, and single-origin Chinese tea, as well as the preparation method. They offer tea served Gong Fu style, brewed in a pot or gaiwan, or a steeped in a glass (without a strainer or basket, allowing you to watch the leaves unfurl). The hot water is placed in a large, vintage, Thermos-like container, and next to your table will be your electric kettle. Every table is topped with a unique Gong Fu draining tray, and all of the furniture in the tea room is vintage or antique Chinese. Every chair, table, tea tool, and piece of artwork shines with a patina of long and affectionate use. Hidden Peak's storefront retail area offers a myriad of teaware options, mostly focused around Gong Fu tea service, but styles and tea cultures other than Chinese are also represented. It's important to mention that the quality of tea available to drink or purchase at Hidden Peak is very good. Their least expensive pu-erh far outshines the top-shelf options from many other tea retailers. We chose two shou pu-erh teas, Lincang Old Tree 2008 and Tengchong Mt "0549" 2007, and loved them both. We also tried and enjoyed their tea glass tea option, which on that day was Damo, a Yunnan green. We were told that the owners source the tea themselves, and work directly with the tea growers in China to choose the best selection, and they certainly succeed. We spent two or three timeless hours drinking tea, nibbling on raw vegan finger foods, and simply being present. When we left, I felt renewed. There is much more I could say about Hidden Peak, but it's best if you just go there yourself. Their website will provide you with their tea and food menus, events schedule, blog, and the history of the Teahouse. Due to the no-devices policy, we could not take pictures, but Hidden Peak's website features some excellent photography on their "Tea House" page. This week's review covers a type of caffeinated "tea" that has not been previously featured on Built from Ink and Tea - guayusa. Guayusa, a plant native to South America, is closely related to mate and yaupon (all three are types of holly trees). Not strictly tea in the sense that it is not from the camellia sinensis plant, guayusa nonetheless has a lengthy history of use in making medicinal infusions in hot water and being consumed for its stimulating effects. 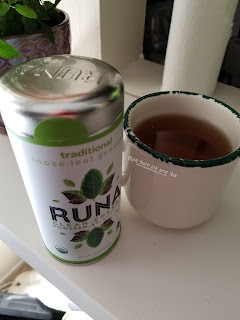 What I am drinking this week is traditional, unflavored guayusa by Runa, a brand who is doing much to promote the benefits and consumption of this plant. 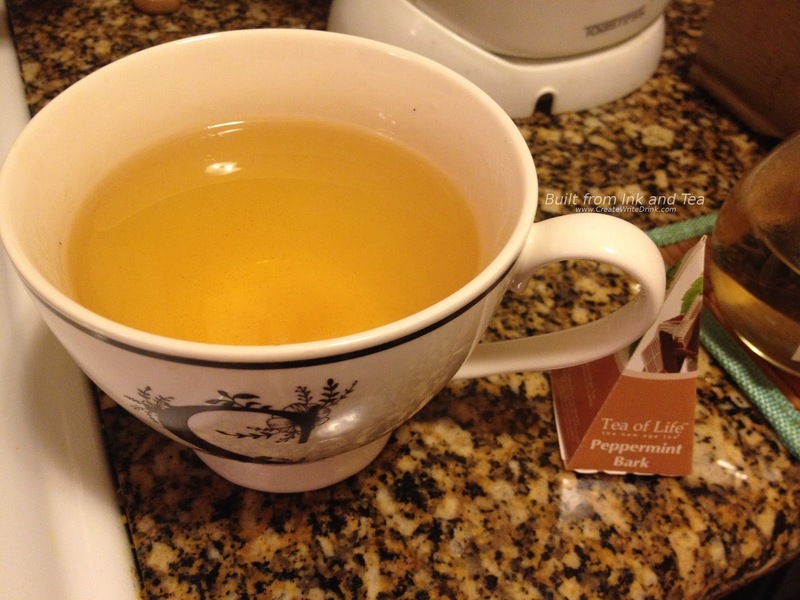 I used my Adagio TriniTEA to brew four cups, using a teaspoon of guayusa per cup, steeping for five minutes. The resulting infusion provided a nice dark color, like a roasted oolong's steeping would. The aromas from the brewed guayusa are deep and earthy. Unlike the earthy aromas of a pu'erh, these are more green and woody. The aroma reminds me of a deeply-intense version of the smell of some wood or underbrush. If one could concentrate the smell of a vine or non-floral plant, it might be close to the aroma of this traditional guayusa. The aroma contains a lot of "green." My first sip contains so many different flavors. I notice first a slight bitterness on the edges of the flavor. Not heavy, it is a light bitterness akin to slight tannin in black tea. Next, the flavors of the main body arrive with bold notes that are verging on being rich, if they were not so green. And green they are, carrying green flavors throughout, albeit with roasted notes, akin to a roasted green tea. Third, an interesting sweetness lays in the undertone of the drink. It is very faint, yet even in the aftertaste, there is a sweet aspect to the roasted green flavor. Overall, I really enjoyed my first experience drinking guayusa. It reminds me of mate and yaupon (probably more the latter) and for good reason, given their relationship. I highly recommend giving Runa's guayusa a try, and it conveniently comes packaged in both teabags and loose leaf formats. On my personal enjoyment scale, I would rate Runa's traditional guayusa a 5. I will definitely be purchasing more, when I finish this container! Coconut, cinnamon, ginger, cardamom, and lemongrass...ingredients for tasty food, but also ingredients for a hopefully-tasty tea. 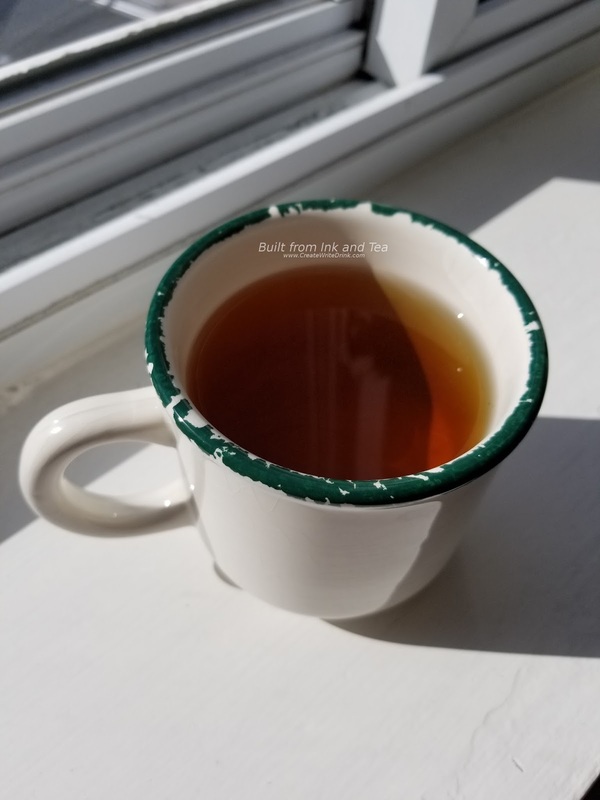 This weeks's tea review takes a look at Adagio Teas' Thai Chai, a black tea blended with all of the above ingredients, comprising a strong cup of flavor. Just reading the ingredients reminds me a bit of last week's review of DavidsTea's Coconut Oolong, but I have a feeling that the cinnamon and ginger are going to make for a vastly different flavor with this tea. My first surprise came, when I read through the brewing instructions. Adagio recommends two teaspoons of tea per cup and a five minute steep time. Sounds like a strong cup to me, which therefore sounds delicious! I add four cups of water and eight teaspoons of Thai Chai to my Adagio TriniTEA brewer, set it for black tea and a five minute steep time, then wait. While the tea brews, I smell the tea container to see what the dry blend is like. The ginger aroma is really prominent, but the notes of lemongrass are surprisingly strong, too. The first cup pours dark, most likely cloudy from the ginger and cinnamon. The aroma, which I anticipated would continue to highlight the ginger and lemongrass, seems overwhelmed by cinnamon. Ginger and lemongrass notes now sit in the background. This is a surprising turnabout, and I take my first sip to see the results of this intense brewing. Immediately, I get flavors of cinnamon and black tea hitting my tongue. A certain heat from the ginger is present, and some sweet herbal notes of lemongrass are noticeable. The cup is intense. The large amount of tea combined with the moderately long steep time resulted in a heady brew. In the body of the tea, the cardamom can be noticed, lending a bit of spice, alongside the ginger. I feel as though the coconut probably smooths the flavors a bit, though it is not as prominent as the other flavors. Due to the five minutes of steep time, the black tea base has just the slightest touch of astringency. I could imagine brewing this tea and actually making a chai of it (with milk and sugar). The milk might tone down the spices, and the sugar would highlight some of the notes that are otherwise overshadowed by the tea's heat. The black tea itself would have its astringent edge removed, and the cup would probably be full of smooth intensity. On my personal enjoyment scale, I would rate Adagio Teas' Thai Chai a 4. I quite enjoyed my cups of it, and I could see it being a very versatile tea that would appeal to a wide variety of palates. The ingredients are blending quite well, and the steeping instructions provide for good flavors all around. Adagio Teas' Thai Chai is available from their website, here. A part of the new Snake Ink line by Bookbinders, Emerald Boa is a great green ink that found at the 2016 San Francisco International Pen Show! Combining coconut and lemongrass, this tea for review reminds me of ingredients that could go into a Thai curry. Maybe this tea would be delicious alongside such a dish. This week, we are reviewing DavidsTea's Coconut Oolong. While DavidsTea does not say what kind of oolong they put into this blend, it looks slightly roasted to me, the leaves lightly oxidized. 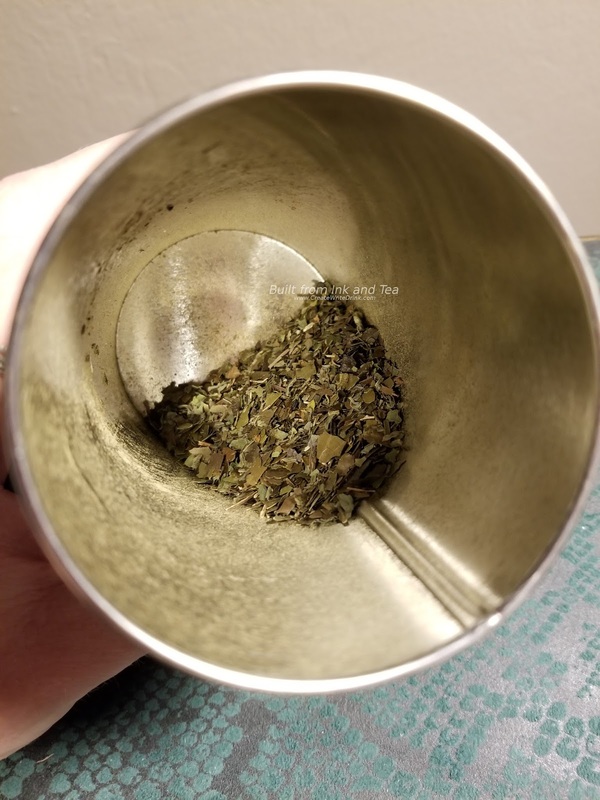 Smelling the container, I get some faint floral notes, which could be the oolong, but the coconut flavoring that has been added seems to overtake the entire aroma. DavidsTea recommends one and a quarter teaspoons per eight ounces of water, so into my four-cup TriniTEA goes five teaspoons of tea. The recommended steep time from DavidsTea ranges from four to seven minutes, and I opt for six, figuring that should be long enough to get a good, strong cup. After six minutes, my TriniTEA machine beeps to let me know that my Coconut Oolong has been finished. As I pour my cup of tea, I realize that this is the last of my container of Coconut Oolong, and I regret waiting so long to review it. The cup smells heavily of coconut with a slight tang of lemongrass to the aroma. Any oolong notes are overwhelmed by the other ingredients or are barely noticeable. The first sip seems rich, when the tea hits my tongue. The flavors are warm and slightly-sweet in a very natural way. But, as I taste the sip in my mouth and swallow it, I find myself slightly disappointed. The tea seems weak on flavor, as though I had not steeped it long enough, surprising given its six-minute steep time. To me, the flavor also seems very singular - coconut, a touch of lemongrass, and not much oolong. 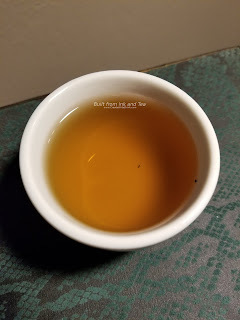 While it could be the case that the oolong has blended very well with the coconut and therefore is not distinguishable on its own, I think I would have preferred a blend, where the coconut has a chance to show itself and be supportive. On my personal enjoyment scale, I would rate DavidsTea's Coconut Oolong a 3. 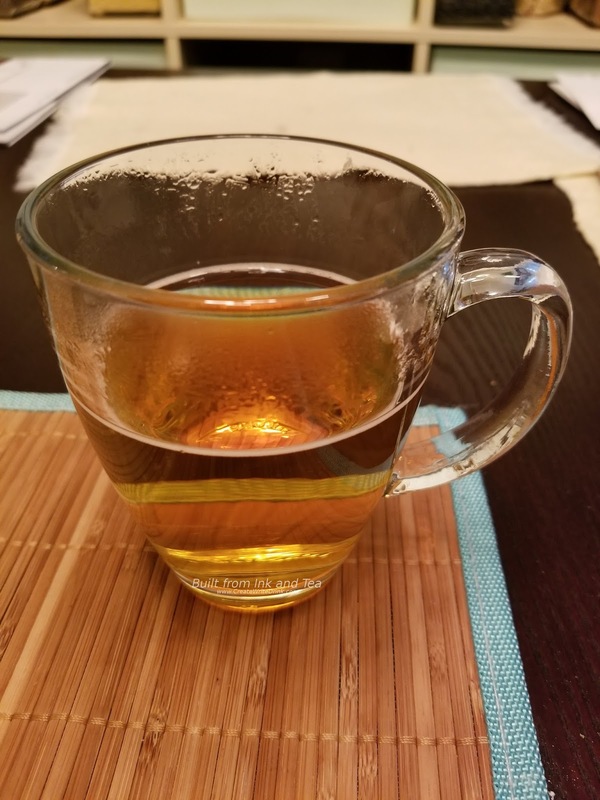 The cup tasted okay, but to me it felt like it was missing a lot, and the balance seemed off. A cup heavier in oolong would have improved this blend. DavidsTea's Coconut Oolong is no longer available. If I had to make a short list of my favorite DavidsTea blends, Super Ginger would be right near the top. Given how much tea I drink, you can be assured that I have no desire to stop drinking, just because I am nearing bedtime. However, caffeine affects me as it does other folks, and decaffeinated black teas have never been my favorite. Herbal blends are good, but what I really enjoy is a nice cup of rooibos. And when that rooibos has ginger (also a favorite flavor of mine) in large quantities, it gets steeped regularly! Super Ginger from DavidsTea blends ginger and peppercorns with green rooibos for a slightly-sweet, and definitely spicy, cup of caffeine-free, antioxidant-rich deliciousness. Normally, when I make Super Ginger, I want my rooibos and ginger flavors to be as strong as possible, so I steep five teaspoons with four cups of water (1.25 teaspoons per cup) for seven minutes in my Adagio triniTea. (Of course I am making a big pot of this - by the end of one cup I most certainly want more!) 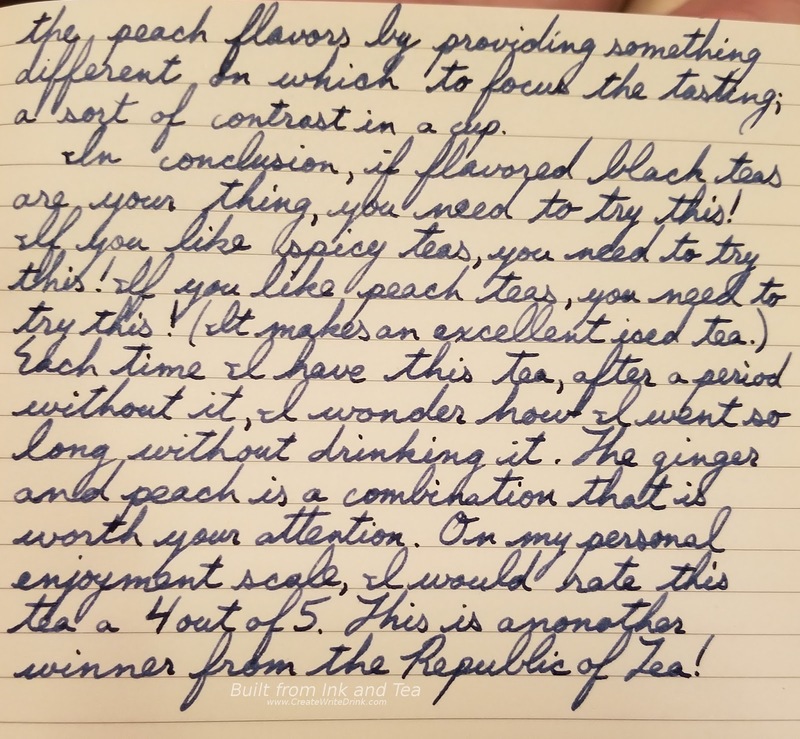 However, for this review, I am going with the average of the four to seven minute range, suggested by DavidsTea, and brewing this Super Ginger for five and a half minutes, using just-boiled water (the same temperature as I use for many herbal blends and black teas). As I wait for my completed cup to cool, I take a whiff of the container of dry rooibos blend. One does not have to put their nose into the container to smell it; the spiciness hits fast and hard. With both white and black pepper, this could be a little bit like a food topping, but the ginger adds some distinct heat and a touch of sweet aroma. By comparison, the steeped cup smells much sweeter with the ginger having been rehydrated and flavoring the blend. Pepper notes are more subtle, now, and the rooibos is noticeable. I can hardly wait for the rooibos to be cool enough to drink. The first sip washes heat over the tongue, but the heat is subtle and not overpowering. The five and a half minutes were ideal for steeping. Living up to its name, Super Ginger provides plenty of ginger flavor that builds the body of this cup. The rooibos sits quietly in the background, letting the ginger be most prominent. On the edges, decently strong, are the peppers. Having pepper in a drink, versus having it on food, is an interesting experience, as the spice spreads thinly over the tongue with a pleasant burning tingle. 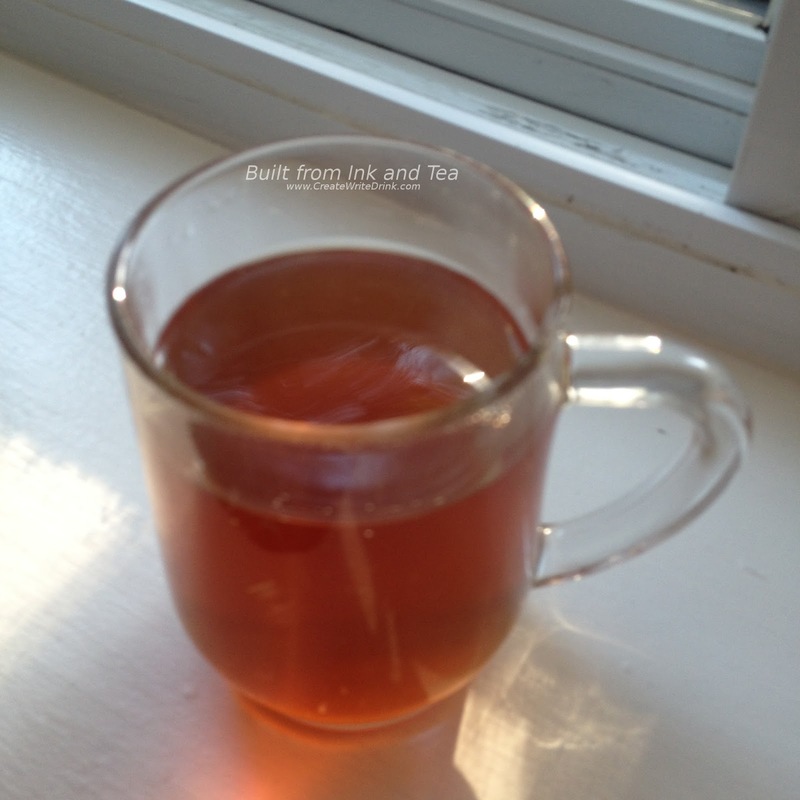 The rooibos does taste sweet from the ginger, though only slightly. One would never consider this drink to in any way be sugary- or fruity-sweet. On my personal enjoyment scale, I would absolutely rate Super Ginger a 5. I enjoy every sip of this rooibos and the flavors it brings. 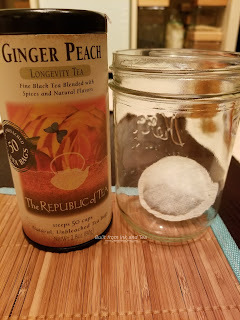 As spicy teas and herbal blends are not very common, I feel that the uniqueness of Super Ginger makes it one that I want to share with others, so that they can experience it, too. DavidsTea's Super Ginger is available in their retail stores and from their website, here. In the past, I have discovered that - outside of the United States - Lipton offers a number of teas that are of a much higher quality than their run-of-the-mill, dust-like attempt at black tea, which they sell all over the United States. (If it sounds like I have a bias, it is because I certainly do...for as inexpensive as tea can be, I find it unfortunate and a disservice to tea drinkers to offer such a low-quality brew.) The "higher quality" is of course relative to what is being mostly offered here in the United States, and it is possible that the tea I will be reviewing today has been imported and is available here. However, in hunting grocery stores, I have not been able to find it. 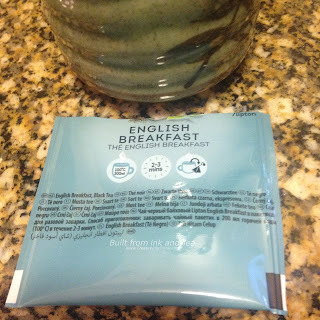 A quick search of Amazon reveals something called "Daring English Breakfast," which can be ordered here State-side, but I am not sure if it is a separate offering from today's review or simply a re-branding. 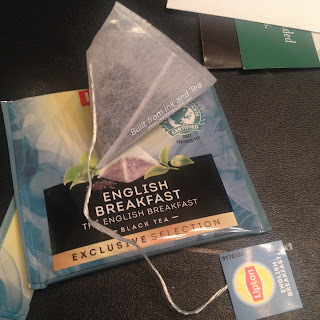 Today's review covers Lipton's English Breakfast, advertised as "Exclusive Selection" on the package. From their marketing website, this seems to suggest a line aimed at businesses with "quality you can see." This marketing toward businesses fits with the fact that I picked up this teabag at a hotel in the Netherlands recently. Opening the teabag, I feel as though I cannot see much of anything. The pyramid bag is fairly translucent. However, the tea in the bag feels as though it has been ground pretty fine. It also has the same smell of generic Ceylon as the Lipton Black Tea one finds here in the United States. Following the steeping instructions (which had very communicative pictures), I poured a cup of just-boiled water over the tea and left it for two minutes so as not to risk over-steeping. Once the steeped cup had cooled, I prepared for tasting. The aroma of the tea smells to me like a typical English Breakfast, albeit a bit flat and unremarkable. If this tea were available to the public, I would say that it would make a great alternative to the Lipton Black Tea that is sold in grocery stores. 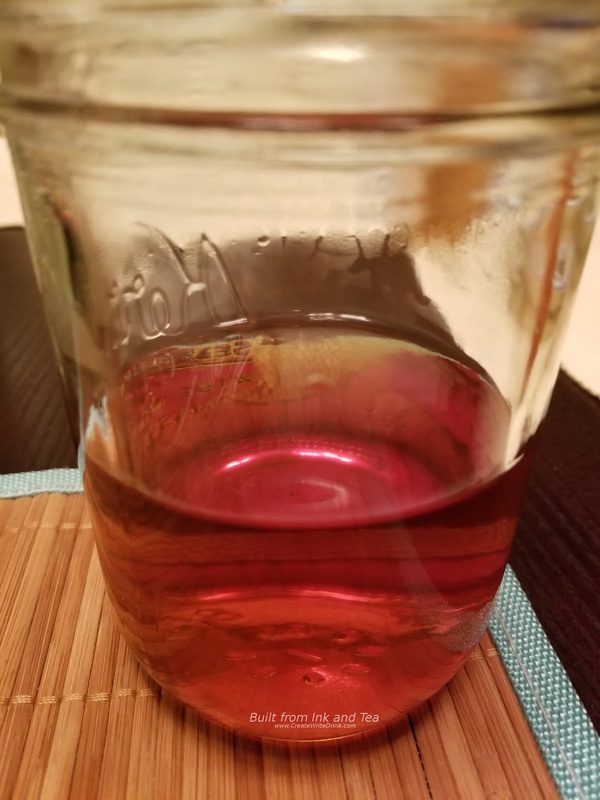 It could be used for making very inexpensive iced tea and would likely produce better results than other, cheap black teas. However, I think that in all tea brewing, there is no substitute for decent - if not good - quality leaves. On my personal enjoyment scale, I would rate this tea a 2. You can learn more about this tea from their marketing website, here. Some hotels and businesses source it for their tea offering. 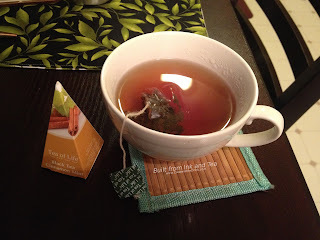 This week, we take a look at (and a sip of) Peppermint Bark, a green tea from Tea of Life's Peppermint Collection. Packaged in its pyramid-shaped cardboard container, the tea sachet itself is not pyramid-shaped, as we discovered in last week's review of Black Tea Cinnamon Mint from the same collection, which you can read here. To emulate peppermint bark candy, Tea of Life has combined green tea with cocoa pieces, licorice pieces, peppermint leaves, and flavors of coconut and peppermint. Some of those ingredients are fascinating, such as the licorice pieces and coconut flavors! 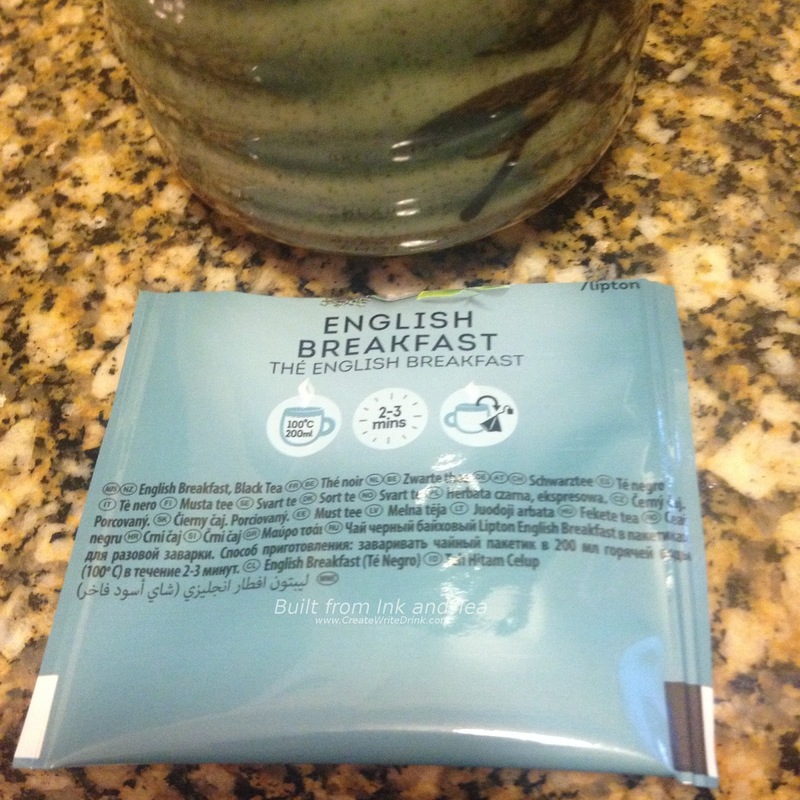 The dry tea blend gives off a smell of mint and a bit of chocolate, though mostly mint. Oddly, I actually find the mint to be a bit reminiscent of menthol, rather than peppermint. Maybe that is due to the inclusion of something else, like the licorice, which I did not specifically smell. The aroma is slightly sweet, which adds a pleasant touch, but there is something about it that is not quite ideal. I steeped the tea sachet for four minutes, using water that had been brought to a boil before being allowed to cool slightly. The resulting cup...smelled like the menthol-peppermint-slightly cocoa concoction that was suggested by the dry leaves. I took a sip and was slightly surprised. While the flavor absolutely matched the aroma, the was not that bad. In fact, I moderately enjoyed drinking the rest of the cup. On my personal enjoyment scale, I would rate this tea a 2. While the cup did taste okay, the overall composition was a bit strange. To me, it did not taste like peppermint bark, and I think I might have enjoyed a mint green tea more than the menthol-like mint in this blend. For a tea blend that intends to taste like a chocolate candy, I think the lack of sweetness - and minimal flavor of chocolate or cocoa - really detracted from the effort. You may be able to find this collection in some department stores around December. Tea of Life does not appear to have a retail website. 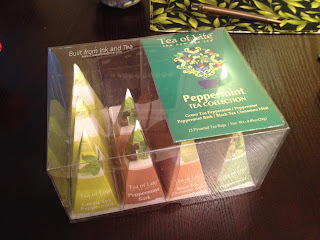 A good friend gave me this Peppermint Tea Collection from Tea of Life, and I felt that it would be an excellent selection to review here on Built from Ink and Tea, especially considering that I am entirely unfamiliar with the company from which it came! Looking at one online retailer of this brand, they certainly do have a lot of options. This box set of twelve tea sachets comes with four different blends, and today we are reviewing the first, Black Tea Cinnamon Mint. I have to admit that I have doubts about this tea, even before drinking it. I typically do not mix cinnamon- and mint-flavored drinks or foods, but I suppose that the heat of one and the coolness of the other could provide a pleasant contrast. I boiled some water and poured one cup of just-boiled water over the tea sachet in my mug, steeping it for five minutes (the upper end of what the package recommends). My first surprise? The sachets are not pyramid-shaped, like the small cardboard boxes are! I had anticipated a shape more akin to Tea Forte's pyramid-shaped tea sachets with their leaf string. The aroma of mint is pretty prominent in both the dry tea and the brewed cup. However, it is in the brewed cup that the cinnamon really becomes noticeable, having not smelled very strong before steeping. With a Ceylon black tea base, the aroma of this blend does not feature much of the actual tea. However, my first sip exploded in a cacophony of flavor. While in some cases, such a description might be a good thing, I am not so certain, here. Five minutes was far too long for the Ceylon tea base. That was my mistake. However, the cinnamon and mint tasted strong enough to cover for the black tea. The cinnamon provided more of a vague flavor than any heat, but the mint did actually add some coolness. On my personal enjoyment scale, I would rate this tea a 2. There is a lot of potential with a combination like cinnamon and mint with a black tea, but the execution feels poor. Even when I had another cup, steeped for a shorter period of time, the tea tasted fine but the flavors of cinnamon and mint were weak. Perhaps Tea of Life needs to look at the blend ratios on this one. 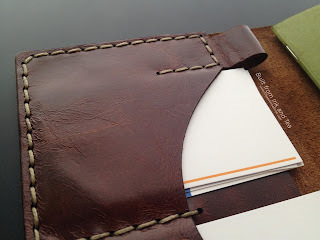 A few months ago, Galen Leather reached out to me with an offer that spoke to the depths of my Field Notes-loving heart. 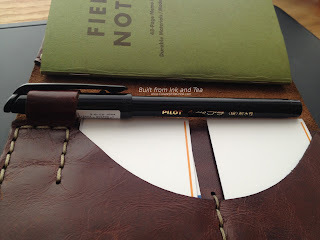 They had crafted some Field Notes covers from leather and wondered, if I might be interested in testing some of the models to review here on Built from Ink and Tea. Of course, I said yes, because if there is anything notebook-related I love more than Field Notes, it would be covers for Field Notes! For my work notes, I carry a single Field Notes notebook. Of course, like a true Field Notes fanatic, I carry far more than one Field Notes notebook at a time, but only one of them gets used for work. Thus, it seemed ideal that I use that notebook for my test of the No. 44 from Galen Leather. No doubt, I would be looking super classy, walking into meetings with my leather cover in hand - or so I imagined of myself. While I am mostly joking, my first impression upon seeing the No. 44 on the Galen Leather website was that it looked very professional, clean, and quality. 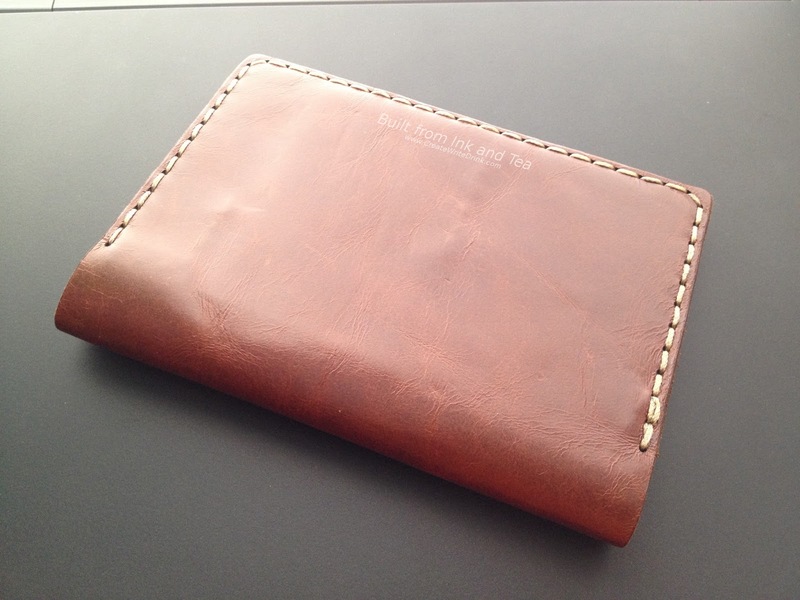 There are a few similar models, most of which differ in the style and number of the interior pockets, but they are all meant to carry a single Field Notes notebook and pen. The number 44 bears a good amount of large stitching, which I felt stood out nicely and contrasted well with the slick-looking leather. While I could have chosen a more rustic-looking leather, like the No. 44 in Rustic Dark Brown (which would have looked great with the stitching, too), I opted for the plain Brown, which in the pictures appears to have a slicker/shinier leather finish. Those pictures are very accurate to what I now hold in my hands. When it arrived, the presentation of the cover was beyond what I might have imagined. The box in which it came was no thin, throw-away container. This was truly a presentation box, hard-sided and sturdy, a decorative Galen Leather design on the front, protecting the contents within. And what contents they were. The leather cover sat gleaming in the box. A Galen Leather-branded bellyband kept it from banging against the sides of the box too much (or so I imagine). A card with the Galen Leather story, an evil eye charm, and the tale of the evil eye was tucked into the package. And finally, a nicely printed note with information about the product, its care, and the history of my specific cover (the color, when it was made, and who at Galen Leather made it)! To the actual use! Foremost, as to the interior design of the No. 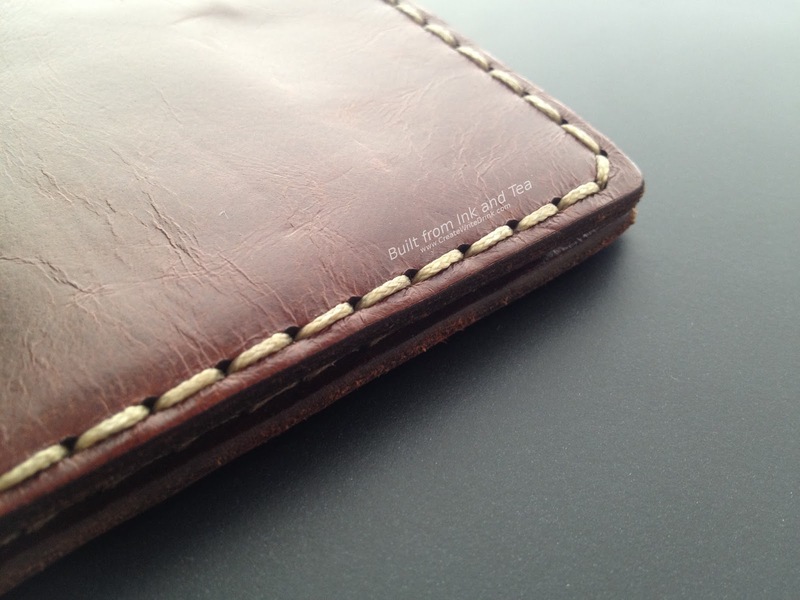 44, it is stitched with two card slots on the left-hand side and a larger pocket behind them. At the top of the left-hand side sits a pen loop, attached to the flap that forms the rear pocket. (This does mean that the rear pocket on the left side cannot be used for holding a notebook like the right side can.) 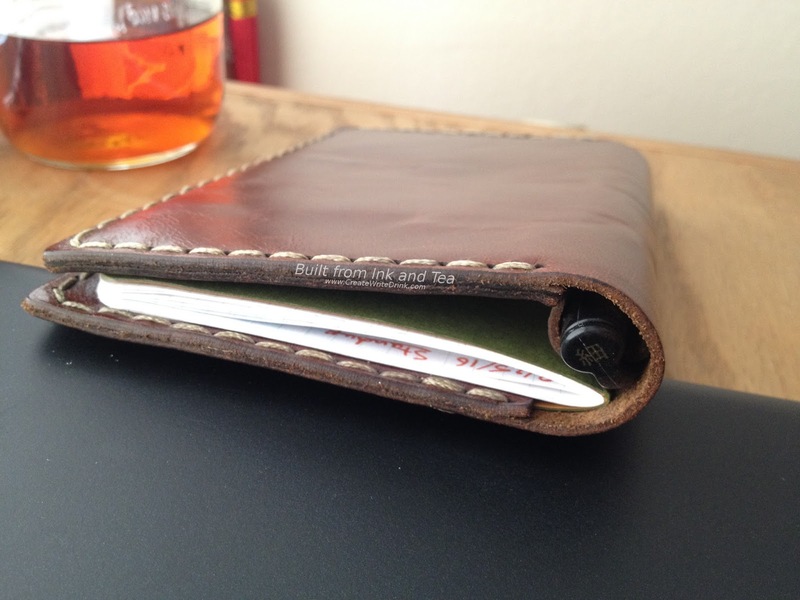 The entirety of the right side is a pocket that holds a Field Notes notebook by sliding the back cover of the notebook into the pocket. In my daily use of the No. 44, I had items in every pocket. The two card slots held business cards of mine and those of clients. I found that each card slot comfortably holds around five cards. (The leather does stretch slightly.) The rear pocket on the left side held varying items from loose notes to receipts or, once, a customs form. Worth mentioning here is that this leather cover is meant to be slim - these pockets are not for stuffing with a lot of paper. (In some respects, I found this to be very beneficial, as it limited me from going overboard with what I was carrying in the cover.) The pen loop of course was used to hold a pen, while the pocket on the right-hand side held a Field Notes notebook for my work notes. Before I even started considering what I might write in a review, I spent probably two months using only this cover for one of my Field Notes notebooks. Foremost are my most obvious thoughts. 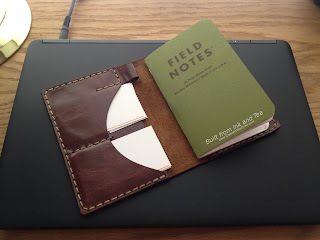 The cover looks great, it smells great (if you like the smell of leather), and it does exactly what it is advertised to do in holding the field Notes notebook. Even when I got to the second to last page of my notebook, I did not find that the cover was negatively affecting my writing. I got numerous compliments on the look, and even with the increased size from a Field Notes notebook, the cover and contents never felt bulky. Over the period of use, the cover itself did get shinier from being rubbed and worn, as it was inserted and removed in a bag or backpack on a daily basis. 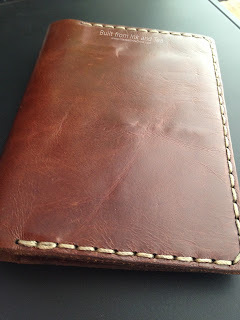 The number of creases in the leather also increased, due to use, especially when a corner of the cover would get caught on something and pulled back a bit. The leather did "stain" the paper cover of the Field Notes that I held in it, a result (I assume) of the treatment to the leather itself. The number of business cards that could be held by the No. 44 cover seemed ideal for me. I rarely carry more than ten cards at a time, and the size of the card holders felt ideal for going into a work meeting or networking event. The part of this case with which I took the most issue is the pen loop. Due to its placement so far to the top of the case, almost any pen is going to stick out the top of the cover, even just a bit. Looking at the way the loop is integrated with the card pocket stitching, though, I can see why it has been placed in that location. With the pen holder there, it also prevents the user from inserting a second notebook into the left flap of the cover. Certainly, this was never the intention of the creators, yet some of their cases with the loop in the middle of the inside would allow for a second notebook to be held, despite that not being part of the original design. A minor point, but worth mention, is that the pen almost certainly has to be removed from the cover in order to write on the left side of the notebook being held (due to the pen otherwise being behind the sheet on which you are writing). This only poses an issue, if you tend to use multiple pens and therefore might not be removing the pen from the loop prior to writing. Users will also find that the loop is limiting in how big of a pen it allows (a Pilot G2 will fit with ease, though a Pilot Metropolitan fits snugly, and the cap of the TWSBI Diamond 580 would not fit into the loop). However, the loop is also thick, so tight pen clips may have some issue fitting. 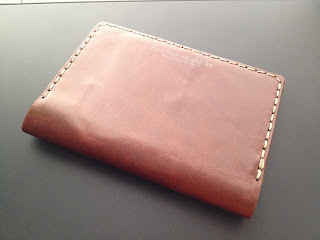 Aside from the nuances that I mentioned, I had nothing but a good experience with the Galen Leather No. 44 cover. Reasons that might keep me from using it as frequently in the future include carrying more than one notebook, wanting to carry more than one pen with my notebook, and carrying pens that do not fit the loop. I recommend the No. 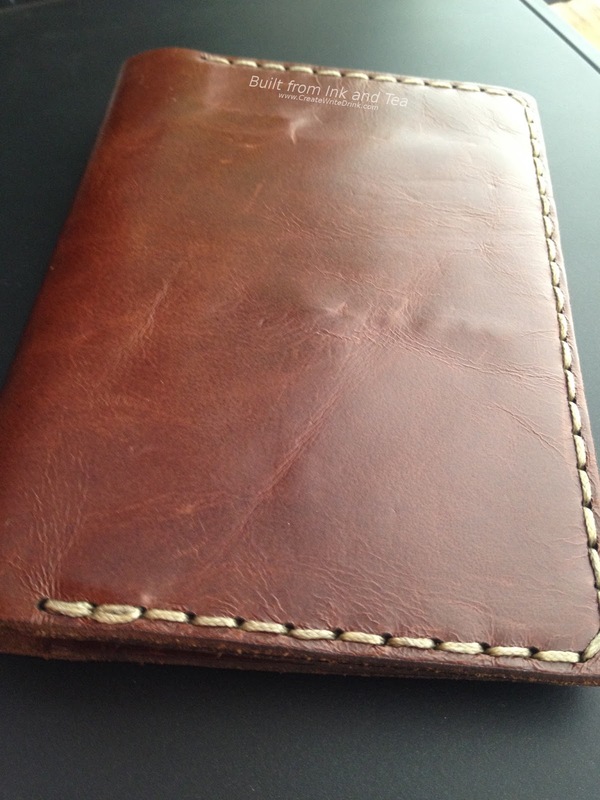 44 cover for a fancy, affordable, single-notebook cover with options for personalization. Galen Leather's No. 44 Personalized Leather Field Notes Cover is available from their website, here. This product was provided in exchange for an unbiased review.